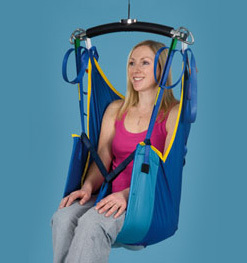 The hammock sling provides maximum support to the sacral area and is used in cases where the universal sling is unsuitable because the patient has poor body tone. The sling can be used in a divided leg or cross over position; this also provides good support for amputees (risk assessment must be carried out for amputee clients). Hammock slings come with leg and shoulder straps, and feature multiple color-coded loops to accommodate various seating positions. Hammock slings come with color coded trim: SILVER for junior, RED for small, YELLOW for medium, GREEN for large, BLUE for extra-large and extra-extra-large. The Hammock sling is available in either regular mesh or quilted material.